For starters, MCT stands for Medium Chain Triglycerides , which is a very concentrated fatty acid from coconut oil. Our bodies can rapidly absorb MCT’s for long lasting energy. Compared to most longer chain fatty acids, MCT’s are a much faster source of energy, which is why people use MCT Oil for a non-stimulant mental boost and even to improve physical performance. There is quite a buzz about Coconut oil and MCT’s and all the health benefits they offer. 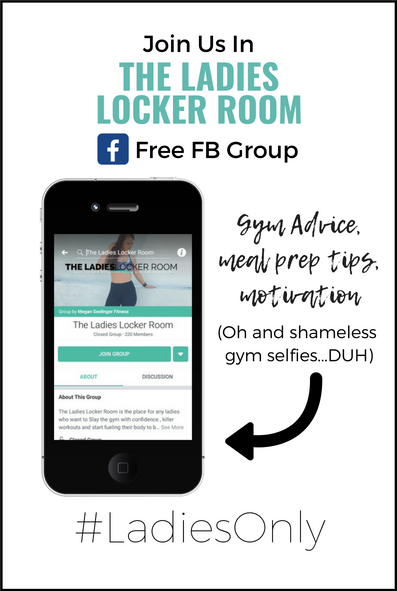 From weight loss, mental clarity, avoiding keto flu, and brain function. When MCT’s enter your cells, it doesn’t need to be broken down and therefore can immediately be used as energy. If you’re on a Keto diet, this also means MCTs will be converted into ketones in your liver to fuel your brain. Help lower your risk of heart disease. Initially, I was hesitant to give MCT Powders a try because I didn’t want to ingest all of the unnecessary fillers that came with it. But after finding out that Perfect Keto MCT Oil Powder had absolutely zero fillers, I was sold. Perfect Keto MCT oil powder still offers the same benefits as MCT oil, but just in a powdered form. The only difference is convenience and usability. With the powder, you can add MCT to almond milk or coffee without the oily consistency. On the other hand, although MCT oil is usually tasteless if you add the oil to your coffee you will notice the oil settling and adding an oily texture to your drink. 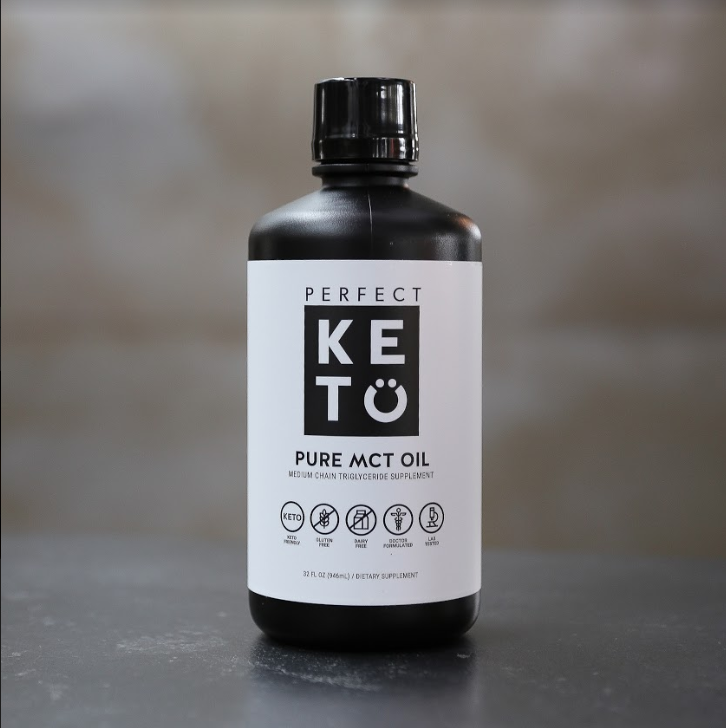 Perfect Keto MCT Oil is 100% Pure C8 liquid MCT Oil, which is a big deal. Only 6% of the MCT’s found in coconut oil are C8, which as you can imagine makes C8 (Caprylic acid) the most desirable of the four types of MCT’s. C8 is a shorter chain molecule than C10 and C12, which means C8 will convert into ketones quicker, delivering a concentrated dose of MCT’s to supply your brain with the Ultimate Keto fuel, Ya know like the premium gasoline at the gas station! Moral of the story is that if you're going to incorporate MCT oil into your Keto Diet Menu, and want to actually experience the mental clarity, energy boost and other health benefits go for the highest quality Pure MCT's like Perfect Keto MCT Oil. 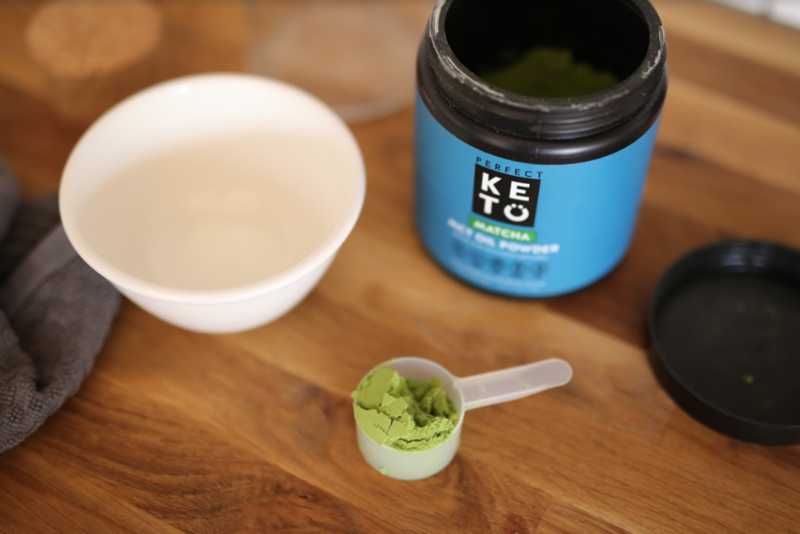 Perfect Keto also has MCT oil powder that you can either grab unflavored or with an added flavor like Chocolate, which has added cocoa powder and sweetened with stevia leaf powder. The most common way is with your morning coffee sometimes in the morning, I'm like "why isn't my brain working today?... Oh yea I haven't had MCT oil yet"
Mix it into your pre-workout drink- after a busy day I'm tempted to skip the gym because I don't even feel like I have the energy to get a good workout in, but adding MCT to my pre-workout regimen gives me a little extra fuel to get a decent workout in. Like I mentioned before both MCT Oil and MCT oil powder have the same benefits it just depends on how you plan to use it every day! If you just want to take a tablespoon shot of MCT in the morning or pour it over salads or other foods (it’s tasteless) you should go with the oil. If you would like to add it to smoothies, coffee or even get fancy by adding a chocolate MCT oil powder to a glass of unsweetened almond milk I’d go with the powder. Like any product I use I did my fair share of research on MCT oil and the two common side effects I read about were increased heart rate and diarrhea, which for the record I have never experienced any of those two things. Ok, this might be TMI, but I’m a healthy pooper like I have no troubles going, but after taking my daily shot of MCT oil I’ve never noticed that it wasn’t any different than any other time. After reading some of the articles on Google claiming they had an increased heart rate I wasn’t concerned because each one of them also mentions they probably took more than necessary. I just recommend not taking them like the shots you downed on your 21st birthday, 1-2 times a day is all ya need! Perfect Keto also has a monthly subscription option if you’d prefer for it to be auto shipped to you either every 30, 45 or 60 days, which saves you 15% every time! Plus you can cancel that at any time. If you are following a Keto diet menu and looking for a little extra mental clarity and energy boost or still struggling with the “Keto Flu” symptoms, give Perfect Keto MCT Oil a try. 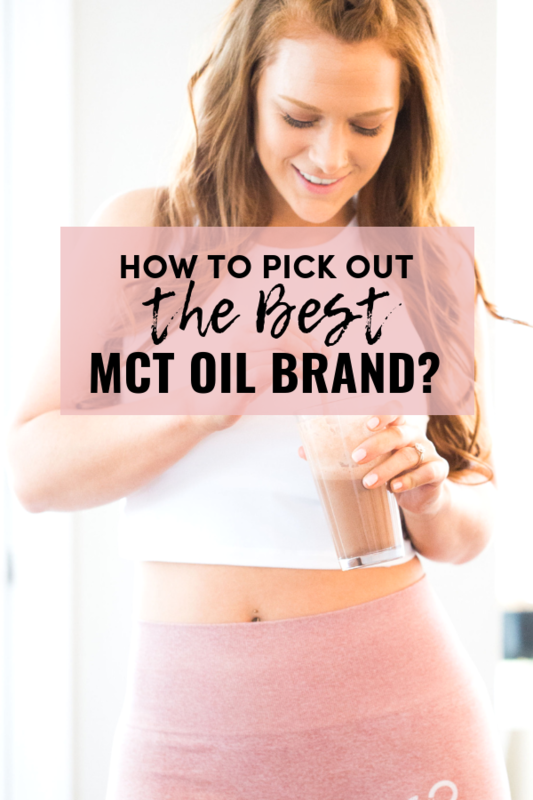 I know you’ll quickly discover the energy and mental benefits of MCT Oil that have helped me along my Keto journey! If you have any more question or have already fallen in love with MCT Oil leave me a comment below I’d love to chat!